The Hague is a royal city by the sea that truly knows how to transform dark days into sparkling nights. The city holds many old traditions to celebrate the winter season. Visit all of Holland’s highlights and heritage in just a couple of hours at Madurodam. Go back in time, step on board of a 17th century ship and sail from Amsterdam to New Amsterdam (a.k.a New York). 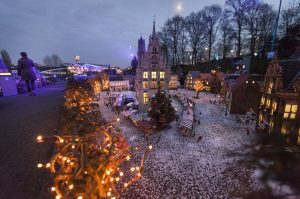 During the Madurodam winter weeks you’ll get to enjoy miniature versions of Holland’s winter wonderlands, including tiny people ice-skating on all of our glorious Dutch waterways. The Madurodam winter weeks last until January 7th. Be part of a festive and old Scheveningish tradition during NYE! Every year Noorderstrand at Scheveningen beach and Zuiderstrand Duindorp beach compete for the title of ‘Biggest bonfire of Holland’. 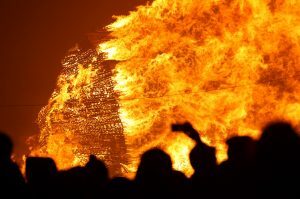 Scheveningen even holds a unbeaten world record for biggest bonfire. People from all ages and walks of life help with the build-up, to finally light it up at 12AM sharp. Pick a beautiful spot at the boulevard and marvel at the heartwarming fire show! 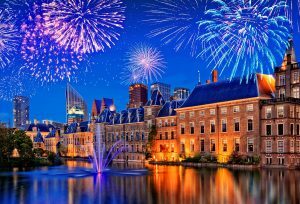 On NYE the city organises a free festivity for all the people who live in, and visit The Hague. Enjoy an amazing light show, lively music, mind-blowing fireworks and of course the countdown to a wonderful 2018! Come down to the historical Hofvijver pond (next to Binnenhof — and super close to TSH). 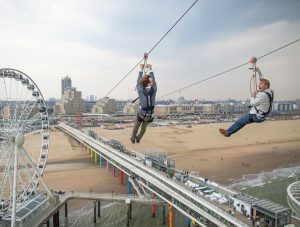 You can call yourself a bona fide boss if you dare to take the infamous Scheveningen new year’s dive on the 1st of January! This 58 year-old tradition has been cancelled only once, due to extremely cold weather. 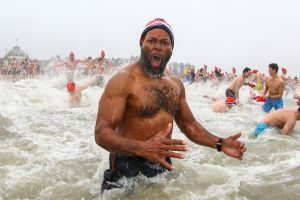 Are you going to be one of the ten-thousand people to take a fresh plunge in the North Sea on the first day of 2018? Ticket sales start the 1st of January 10:30 at Scheveningen beach, and it’s only €3. Unox will donate a part of the money to the Food Bank. So, be cool, be chill and do good! Planning to visit The Hague this winter? Add that extra special touch to your stay at The Student Hotel and book a room with us.